Is it possible for marketing to have a spiritual component? Part of my work life consists in marketing my books. I do it here on my website and sometimes in person. As a typical introvert I far prefer writing books over selling them. Writing nourishes my creative spirit while marketing drains it. It can feel forced and even a bit sleazy. Those of you who are entrepreneurs, creating books, music, business products, services or crafts, know the difficulties of connecting with customers. How do you keep the conversations real? How do you avoid coming off like a used-car salesman? Where do you begin if you don’t have that “gift for gab”? Recently I discovered quite by accident that marketing too can be satisfying if I choose to see a spiritual side to the work. 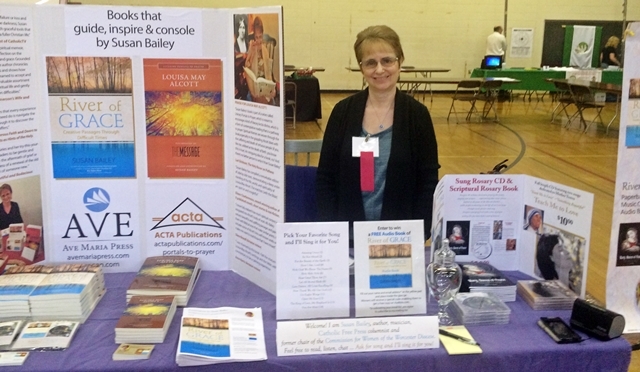 At the recent Springfield, MA Women’s Conference I was pleased to have exhibited. Frankly I dreaded the day, rising at 4:15 am, making the long drive and then somehow maintaining my energy. Making small talk is something I find hard to do and yet it is essential to good marketing–you must reach out to your customers. Then came the obvious conclusion–why not use music as the icebreaker? I brought along my guitar and a songbook of favorite hymns from church. I would ask people to request their favorite songs. It was a great way to keep busy, preventing me from hovering over people as they mulled over my books. Singing attracted attention, inviting people in to stop and take a look. People smiled at me when they heard a favorite song. That made me smile back because I realized I had made them happy. People lingered longer at my table, listening as they read my work. Singing to them rather then hovering over them trying to make conversation created a relaxing atmosphere that made them stay longer. It gave them space and permission to read. People warmed up and began conversations with me which resulted in several meaningful exchanges. And in the end, I sold more product. I rarely walk away from a gig or function feeling satisfied. Why couldn’t I sell more product? Why could I not connect with people? You can see how the stench of self pity creeps in. This was the first function I’ve done in a very long time where I felt completely satisfied. Making that small profit was a blessing to be sure, but knowing I had successfully reached out and connected with others was the true accomplishment. Contests and giveaways are a great way to engage and to remain engaged by collecting email addresses for your list. I discovered a new way to break the ice; I found my language. Singing ministered to my customers. It ministered to me as well. Making use of the gift that God has blessed me with injected that spiritual component into my marketing. It turned selling into service. I have a favorite maxim: “I’m slow but I get it eventually.” Ya think?? I’ve been gigging as a musician since 1992. It took me twenty-four years to figure out the language of music. That’s slow! I smile at myself sometimes at just dense I can be. But I also smile in thanksgiving that grace finally opened my eyes. Use what makes you unique and create a language with it to engage your customers. Now, I am eager to try it again! I love the idea of those smiles as I sing, knowing that a heart is being touched. You may not be able to play music yourself but you can certainly have music playing in the background and even sing along, inviting others to do the same. Are you artistic? Maybe you could offer to sketch someone’s portrait and give it to them as a gift. Are you a good cook? Offer free homemade treats with the recipe. If you’re a crafter, show how you create one of your crafts. Actually make the craft in front of your customers. If you are offering a business product or service, have a worksheet on hand to give to your customers that offers tips and solutions to common problems. Maybe you’re a closet comedian. Use humor to engage people in conversation. These are just some ideas to help break the ice and connect with others. It’s really about giving yourself freely, without concern for “making the sale.” That part takes care of itself. If you don’t have the “gift of gab,” what do you use as an icebreaker? I face so many of the same anxieties when I’m selling books! I can’t play music well enough to share it publicly, but I do offer free poems when I am out selling books. It’s a great ice breaker, and asking visitors about themselves just feels so much more faithful and service-oriented than telling them about me and my stuff. Introvert power!